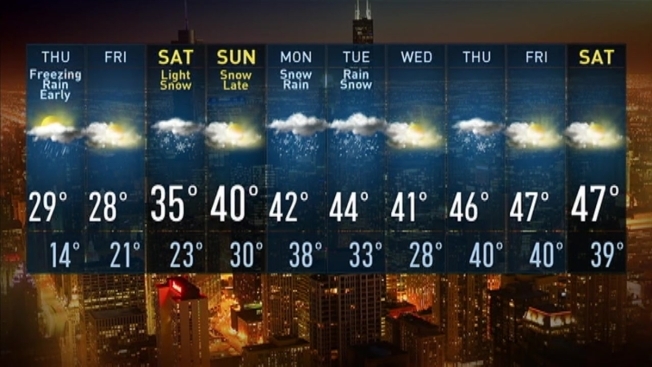 The Department of Streets and Sanitation has deployed 210 trucks to salt the city’s main streets and Lake Shore Drive early Thursday as forecasters warn of freezing rain across the Chicago area. Authorities are hoping to prevent icy conditions for the morning rush while the National Weather Service put a freezing rain advisory into effect until 9 a.m. Thursday. Freezing rain or drizzle could cause ice accumulations of up to a tenth to an inch in Cook, Lake, McHenry, DuPage, Kane and DeKalb counties, among others, the advisory said. Motorists were urged to be prepared for slippery roads and slow down, using caution while driving. The city’s salt spreaders would first focus on salting arterial routes, then move to neighborhood streets, if necessary. Thursday is expected to be mostly cloudy, with a 60 precent chance of rain and a high of 31 degrees, according to the weather service. There is a chance of snow between 9 a.m. and noon, but less than half an inch of snowfall was expected.